Moschino will launch Toy 2, a follow-up to 2014's Moschino Toy. Notes for the woody floral include mandarin, apple, magnolia, peony, jasmine, white currant, musk, sandalwood and amber wood. 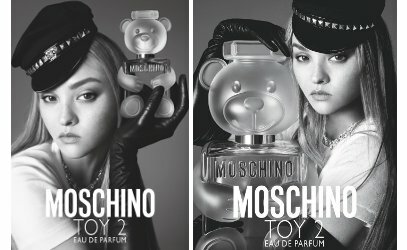 Moschino Toy 2 will be available in 30, 50 and 100 ml Eau de Parfum. I love the original Moschino but who knows what this one will smell like. Interesting bottle…. I never did smell the original Toy. Or if I did I’ve forgotten it. Either way, this does not sound compelling but the teddy bear bottle is darned cute. And extra points for frosted glass for me!